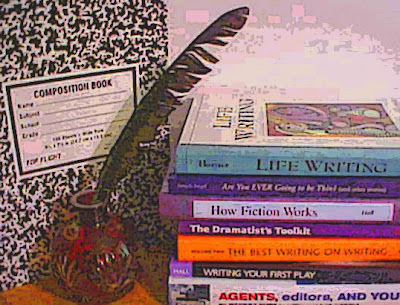 Writer: A Writer's Professional Networking Site--Coming Soon! But nought save home-spun Cloth, i'th' house I find. What better way to launch a brand new website: a poem in which an author addresses her book. So what is a "writer's professional networking site"? Think in terms of Facebook or Myspace, but on a professional level, a targeted space where writers and aspiring writers will be able to connect with each other and post pertinent information about their publications, upcoming publications, photos, excerpts, resumes, and even embedded personal video clips of public readings--in short, a professional site that will offer writers a place on the internet that does not compete with millions of teenagers more interested in their social lives. When users land on Writer.me, they will know that this is a serious site devoted exclusively to writers who are passionate about their work. So why Writer.me? Why not Writer.com? For website developers who have come to the .com era late, all the prime one-word domains in .com (and other common extensions) are either in use by others or are being offered for six or even seven figures. And Writer.com is not even for sale at any price. Here's why: the term "writer" is considered to be a highly desirable keyword because it receives millions of Google searches per month and is also a high-revenue term, so Writer.com is way out of my financial league. In April 2008, when a lot of buzz began circulating that .me, a new Top Level Domain (TLD), was about to be launched, I knew I was interested in acquiring Writer.me. As an average internet user, you may have missed this news, which seemed to be known only by professionals who buy and develop domains, but you will soon be impacted tremendously by this domain extension, which is being marketed as ".me is about you." During the application process (known as Sunrise and Landrush), companies wanting to protect their trademarks could apply during Sunrise and individuals wanting to apply for a generic term could apply during Landrush for .me domain names, weeks before the general registration period, which opened on July 17, 2008. If only one applicant applied, then the applicant was awarded the domain name; this is how I acquired poet.me. If more than one applicant applied for the same domain, then the domain went to a three-day auction, which was held among all applicants, which is how I acquired writer.me. While .com domains are considered "King," developed premium term websites with other extensions (.net, .org, .biz, .info, .us, .me, and myriad other TLDs) do very well on the search engines (Google, Yahoo, and MSN). For search engines, all keywords being equal, content is more important than a fancy TLD without significant content. Premium .com domains that are simply "parked" revenue directories earn their owners revenue through "direct navigation," in which users type the actual address into the URL box (for example, www.writer.com) and land on the actual page. The owner makes money when users click on ads. However, only about 10-15% of internet users actually use direct navigation as a search strategy, and this percentage seems to be dropping--probably because we are all becoming more internet savvy. For the most part, search engines penalize "parking pages" by not ranking them very high. For example, writer.com, a parking page, does not enjoy first-page status on Google, but to the owner, who is more interested in earning passive income through direct navigation, top ranking isn't all that important. Internet users are not likely to use direct navigation on a domain like writer.me, but if the .me version is developed properly and as more members come on board, it could reach page 1 status on the search engines. My point: this site has the potential of becoming a powerhouse professional networking site for writers, which is precisely my goal. Members will enjoy a definite advantage: an easy-to-remember URL, for example, www.writer.me/yourname (when available) or www.writer.me/username (when available, your choice). Anyway, that is the plan. If you're a writer and are interested in joining such a site, please post what kind of features you would like to see in a writer's professional networking site. Illustration copyright 2008 by the Writer.me administrator. This website is copyright 2008 by the owner of Writer.me. Text and illustrations may not be republished or reposted without prior permission.